Sure, we here at Macworld have an Apple TV in our office—or, more specifically, in the office of our head honcho, Jason Snell—but we’re hardly about to stop watching movie trailers long enough to put the little fellow to a thorough dissecting. Anyway, that’s what the team at iFixit is for. A dearth of visible screws is not the kind of thing that’s going to slow them down, either. After prying the base off Apple’s latest device, they uncovered a number of interesting tidbits, such as a place that looks ideal for soldering a dock-connector port, the same Samsung 8GB flash chip that you’ll find in the iPad, and the same Broadcom 802.11n Wi-Fi/Bluetooth/FM chip that’s in Apple’s tablet as well. Unsurprisingly, the new Apple TV also shares an A4 processor with the iPad and the fourth-generation iPod touch, though the model differs from the one inside the iPhone 4. You’ll also find 256MB of built-in RAM and a 5.95 watt power supply crammed in alongside. 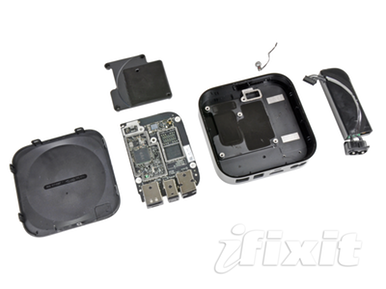 That low power consumption combined with an efficient standby mode and ease of repairing also leads the iFixit folks to conclude that this may be “the most eco-friendly set-top box of all time.” Sounds pretty good to us—now if only we could get a wee bit more content from the TV and movie folks.